Items in Inventory that are no longer available to be issued and are no longer ordered can be discontinued. Discontinued items will not be available for transactions, but can still be reported on. Items can be easily discontinued from the Inventory form or from the home page. 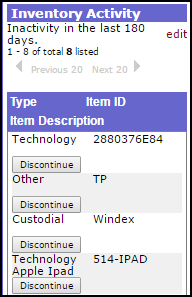 Click the Inventory tab and click on the Item Number of the item you wish to discontinue. You can also search for the item number in the Search for box. 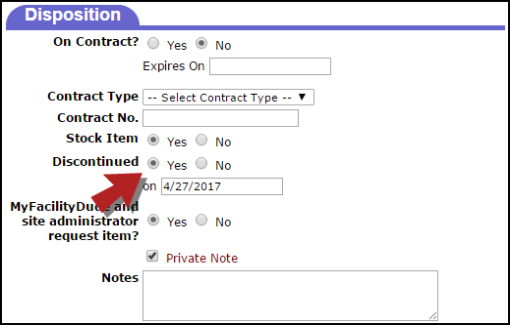 In the Disposition section of the Add/Update Inventory page, Select to Discontinue the item by clicking the Yes option. Click Save at the bottom of the page to discontinue the Item. Discontinued items will have a ( ) icon appear next to the Item Type in your inventory list. Items with no inventory activity in an extended amount of time will appear in the Inventory Activity section on the right side of the home page. *Note: Click the edit link to adjust the period of inactivity. Click the Discontinue button for any items that need to be discontinued. A pop-up will appear where you can edit the discontinue date if needed. Click Save to discontinue the item.